To me the greatest stress a Firefighter can endure is having a running mate trapped in a rapidly growing raging fire. 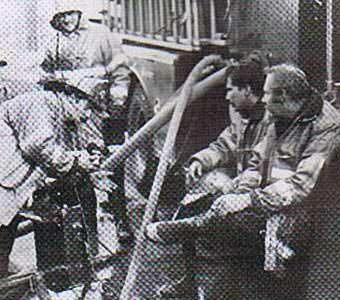 This occurred on a balmy fall Friday the 13th afternoon in September 1985 down in the 7th Battalion. The fire incident was described to me by one of the participants in the rescue. FF Ruben Diaz was tillering Ladder 8 that day. He was working a half- shift work relief and anticipated leaving the engine house early in the evening to have dinner with a beautiful young lady he had met a few weeks earlier at an Ann Arbor Art Fair. The alert bell sounded for Engine 27 and Ladder 8 and they were told to respond to a fire at Regular and Rademacher. Ruben was sitting high in the bucket seat of Ladder 8 as they sped to the location. He said it was a beautiful autumn afternoon but things started to change quickly as they neared the location of the fire. Dirty black brown smoke was swirling and belching from a store front building with apartments in the rear. Ruben and his truck mates forced open the front door of the cinder block structure. Kneeling near them, putting on the face pieces of their masks, was the crew of Engine 27. The pumper was dropping line as it headed for a hydrant. The men of Ladder 8 moved through the heavy smoke and breached the back door. Moving quickly they found a stairway to the second floor. They moved upward to ventilate the building to drain out the dense smoke. The engine crew was struggling to locate the seat of the fire. The building had been cut up and compartmentalized into several small rooms. Squad 4 arrived and entered the fray. They ran into walls and dead ends where you would normally expect passageways to be and, conversely, openings where there should be none. When Ruben came downstairs he could hear the usual sounds of controlled chaos as Detroit Firefighters aggressively attacked the flames. It was a real puzzle to figure out and chase down this nasty fire. The sounds of confusion told Ruben the attacking Firefighters were only having limited success. He thought he heard a muffled sound ahead of him in the thickening hot smoke. From his days at Engine 29 he learned how to operate alone in an emergency. Engine 29 is in a location surrounded by railroad tracks and was many times cut off from help by slow moving trains when responding to a fire in its own district. Not a good thing to be alone in a fire but circumstances will usually force the issue. Ruben said he heard the muffled sound again. It was a voice in the dark. At first he was not certain and he questioned himself. Then he heard it again. This time it was an audibly desperate plea for help To this day Ruben doesn't know how he didn’t fall into the gaping hole he encountered. His approach had been cautious. He was crawling on his hands and knees moving blindly through the hot smoke towards the cries for help. There was now screaming coming from the hole. Ruben said, “I reached down and started fishing around with my arm in the area where there once was a floor. The voice became calmer as our reaching slapping hands made contact. The hand grabbed mine and hung on for dear life. It was a super feeling. It was hard to tell who it was and how he had fallen into this gaping abyss. It turned out to be Frank Kanopsky, the boss of Squad 4. I tried to pull him out but I had no leverage and Frank had lost his strength. We continued trying for a few seconds. It was sadly futile. My wrist was burning and my lungs were sucking my mask empty. Now both of us were shouting. I heard another voice in the smoke and directed it towards us. We were in desperate need of help. What a godsend when I made contact with FF Larry Cooper and took his hand and placed it in Frank’s outstretched hand. Soon more troops arrived. It was Frank’s guys, Fabio Muscat and Bob Garrigan. I believe they brought in a line and cooled Frank down with water. They lowered a hose line down for Frank to crawl up but he was too weak to do so. A Dutchtown ladder was quickly brought in and Frank was able to climb out of the death trap he was caught in. I was not witness to how they got Frank out because as soon as I was sure that Larry Cooper’s hand had a good hold on Frank’s hand I stumbled toward the light down a corridor and plunged through a doorway onto the outside sidewalk. All I could think of was, oh happy day were we ever lucky. On reflection I know that we sometimes make our own luck." watch Fabio Muscat get some fresh air.